Hurrah, at last some decent weather had arrived for today and for tomorrow! 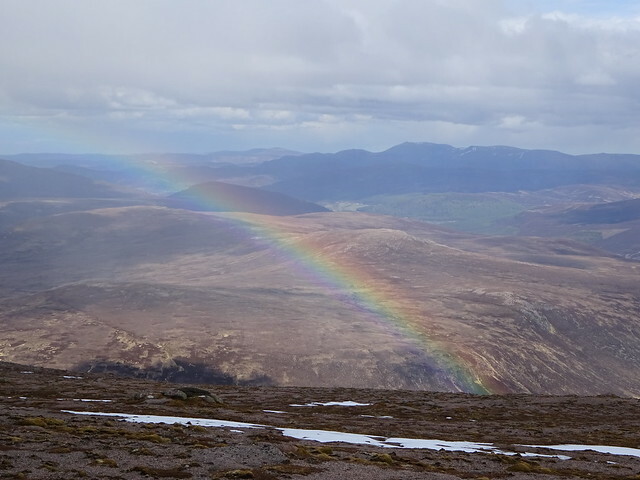 Which meant my western Cairngorms expedition got the green light. Like its aborted eastern counterpart this route had been devised to avoid a few too many long walk ins/ outs. I set off from the car park 1km north of Auchlean. There have been a few changes to the footpath at the farm. Signs point the way, but not in the direction I wanted to go. 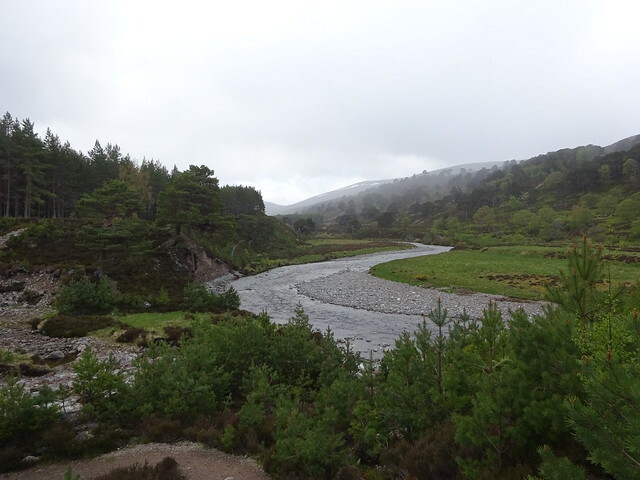 After a bit of a detour I did make it to Achleum and from there I followed the path along the river Feshie. 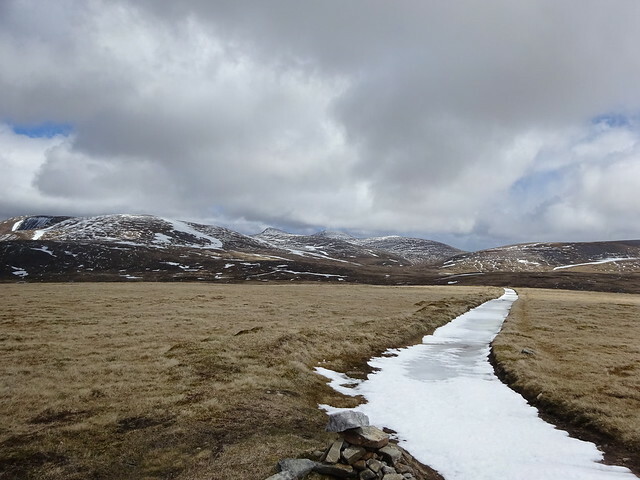 Plan was to take a shortcut towards Meall nan Sleac, but the pathless route looked very rough and unpleasantly steep. So instead I continued along the river over a new looking bridge across the Allt Garbhlach and into Coille an Torr. What a lovely wood this is! Opposite Carnachuin the long ascent started, but at least the track was very good and the views back to the Glen Feshie Corbetts got better and better. 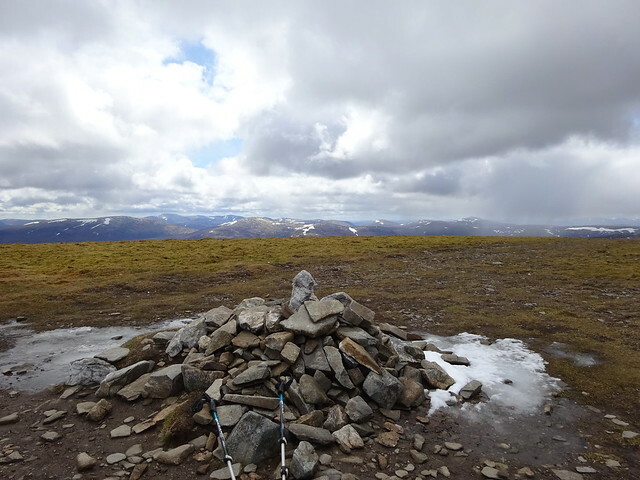 Mullach Clach a’ Bhlair is the highest point on the moor, so not the most spectacular summit. 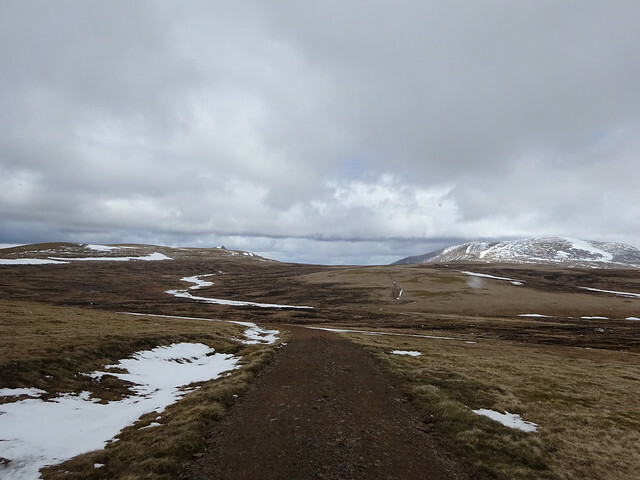 However, the views over the desolate emptiness of the Moine Mhor I liked very much. 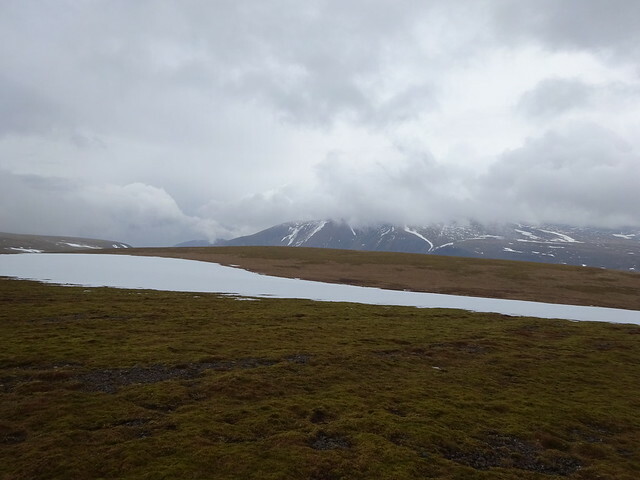 The cloud and remains of snow really added to the atmosphere. 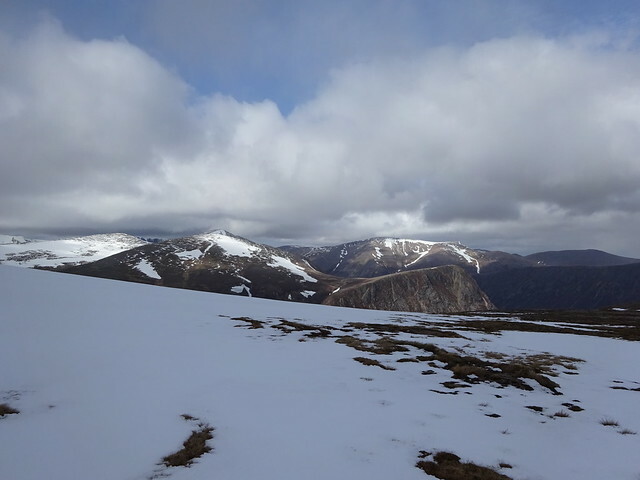 So onwards with the walk over Moine Mhor towards Tom Dubh. This was easy along the good track with hardly any ups and downs. I loved the place. Ahead the snowy track led the eye towards Sgor Gaoith and Braeriach and behind me to more emptiness beyond. 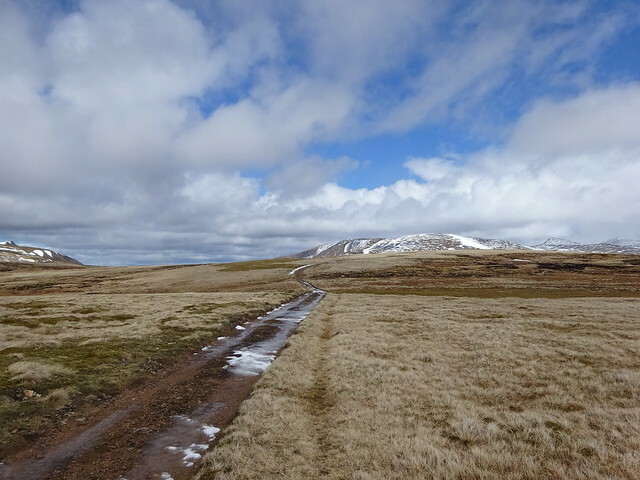 The track ends at the Allt Sgairnich, but a faint squelchy path heads on to Tom Dubh. By now the weather had brightened up considerably. Tom Dubh occupies an awesome setting, with great views towards the steep corries of Sgor Gaoith plunging down to Loch Einich. I crossed the Allt Luineag in a rather roundabout way, first across a tributary with boots on and then across the main river with boots off. The water was cooooold! 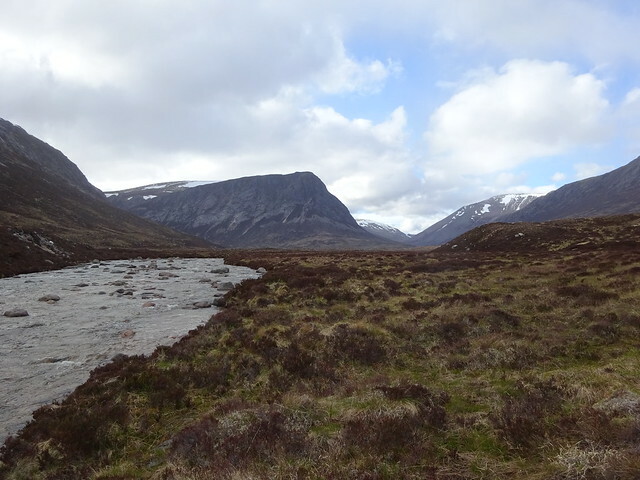 From here it was a pick-your-own route to Monadh Mor. Just before the summit I met two walkers. They had just done Beinn Bhrotain and were now heading back to Corrour bothy. 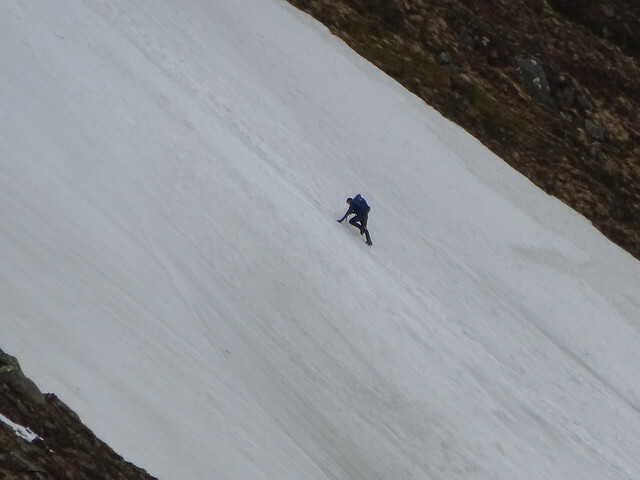 We had a short chat and I asked about the conditions in Coire Cath nam Fionn. 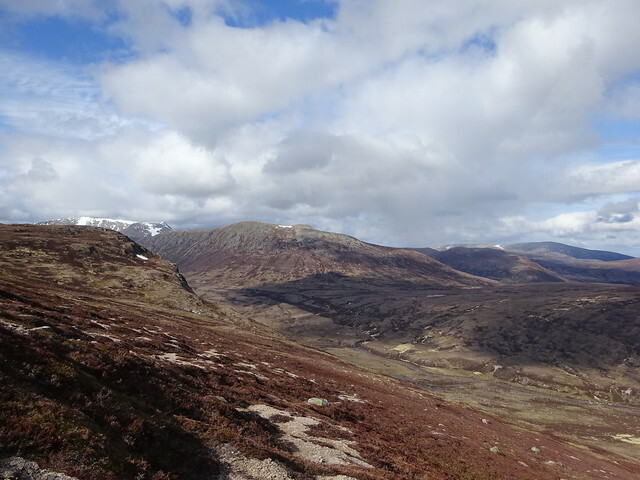 They advised against a descent down this corrie and suggested their ascent route, to the east of the corrie, which was steep but had less snow cover and should be doable for my descent. I thanked them for this and then we said our goodbyes. 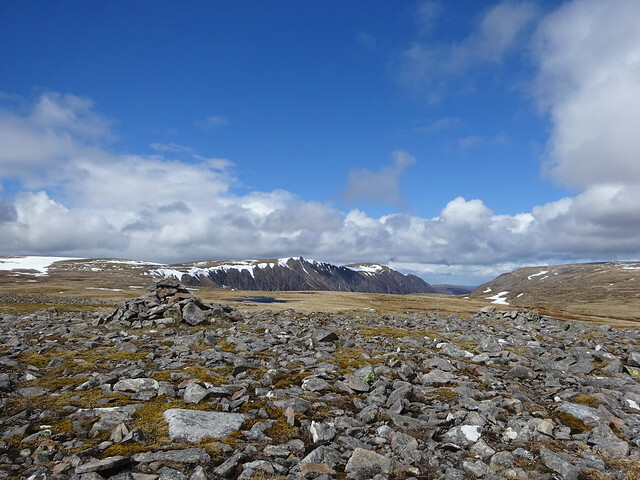 The summit of Monadh Mhor offered great views across the Moine Mhor plateau. Onwards to Beinn Bhrotain. On the descent to the 975 bealach it was clear that an exit down Coire Cath nam Fionn was indeed off the cards, as was the alternative suggested by the two walkers. Too steep and too much snow for my liking and then there was the matter of finding the start of their advised route through the crags. 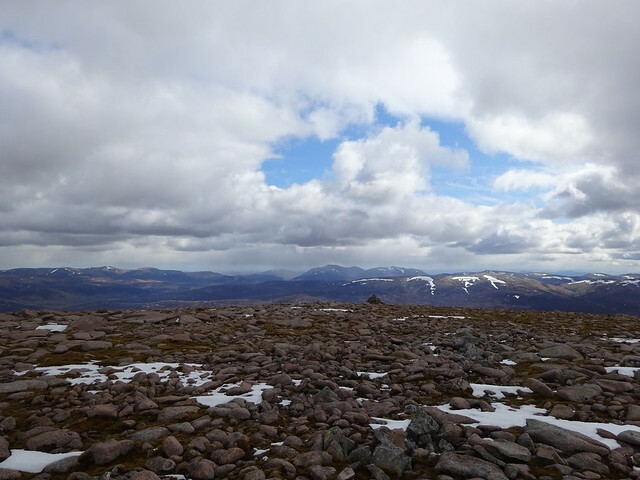 After a short and steep pull up the stony hillside, the summit of Beinn Bhrotain was reached. There was a wind shelter, which had completely filled up with snow. 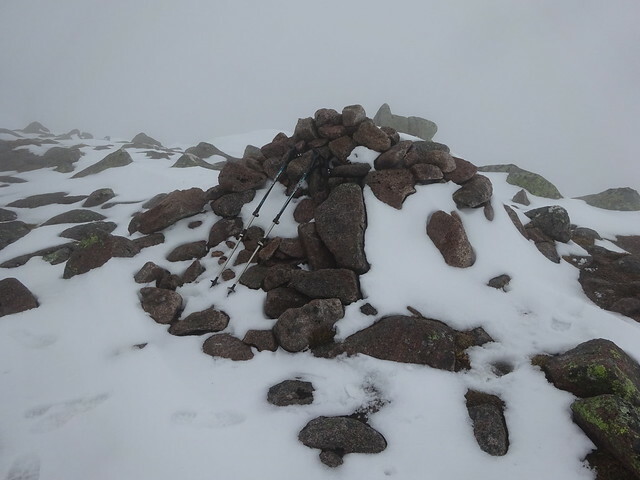 Luckily there was a more suitable shelter at the trig point, for a short rest and some food. 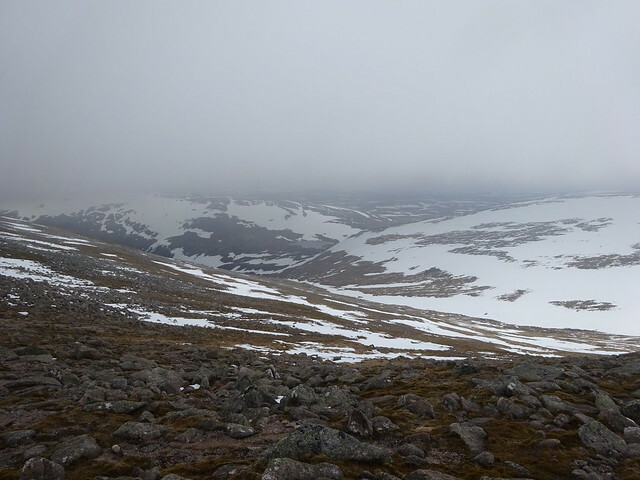 Plan B was to descend over the east top down to Glen Dee. 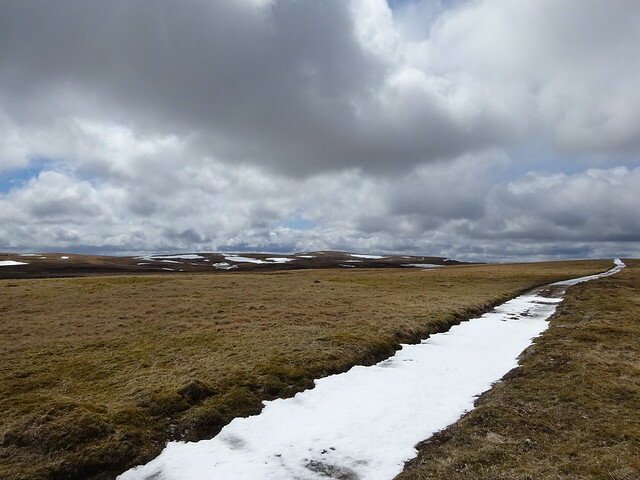 There were some snowfields to be negotiated but the snow was soft so it wasn’t a problem. Crossing the river Dee (boots had to come off again, brrrr) was a bit trickier, but even that went well. 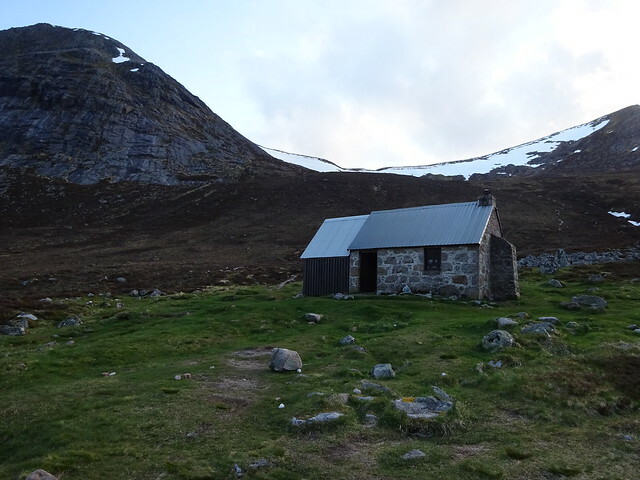 Now there were only 4 or so boggy kilometers left to Corrour bothy. It was a busy evening for a weekday: the bothy was full and there were two tents already. I added mine to the collection, had dinner, went to the bothy say Hi to the two walkers I had met on Monadh Mor and spent the rest of the evening chatting with fellow walkers. It was very cold when I woke up in the morning. So I wasn’t in a hurry to get out of the sleeping bag. A quick peek outside didn’t speed things up either. There was no hint that the promised decent weather would come off today. I had breakfast inside the tent and then started packing everything from within until it was only the tent and groundsheet left and it was inevitable, I had to go outside to pack those. With that done I set off. The night before I had asked those residing in the bothy about the conditions higher up. They said the only obstacle was getting through the remains of a cornice, but others had already cut steps so it shouldn’t be a problem. Upon arrival at the cornice I had a choice of two routes. The first lower down, less steep but more snow to cross. 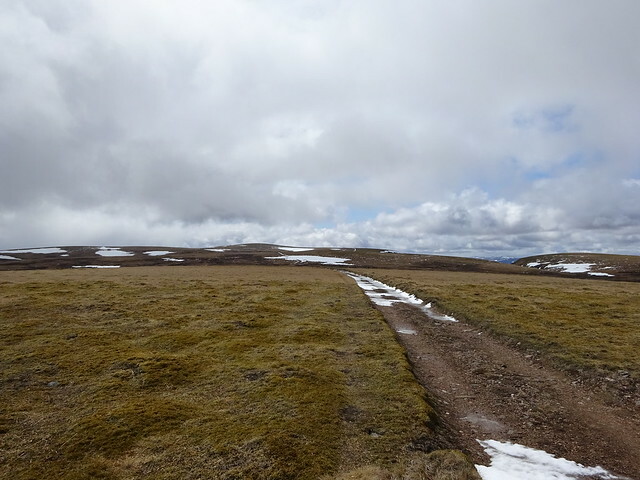 The second a bit higher up, steeper, but the band of snow was narrower and I could see where it ended. I went for the latter. It was steep. The steps weren’t too icy, although some were a bit shallow and difficult to push off from. Still, better up than down and the walking poles came in handy. I could now see that the other route crossed even more snow than had been visible from below. Once on terra firma I had second breakfast and then made my way up the Devil’s Point. Looking back, I saw a group of three walkers just below the cornice. One went for the longer route, the other two went for the steep and short route. I watched as they ascended. 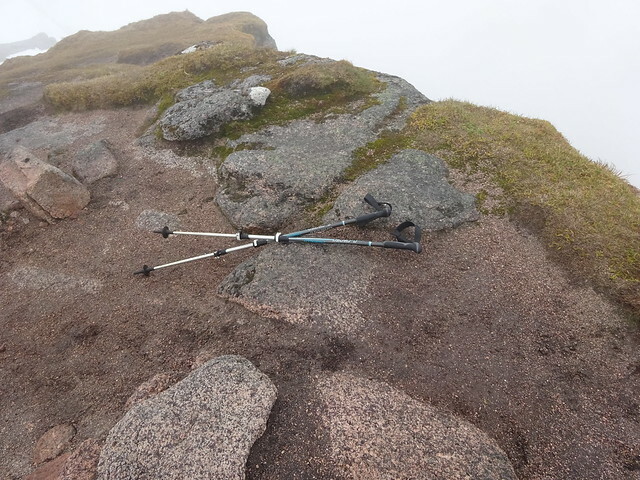 The person on the longer route slipped and slid down quite a few meters before he stopped himself with his walking pole. OMG! Soon after I was on the Devil’s Point. It was cold so I didn’t stay long. On the way down I had a chat with 2 of the group of 3 (the other was waiting at the bealach). It turned out they were the same guys I had met on Monadh Mor yesterday. The one who’d had the slip said that his route had been very icy and that the steps had been very worn. 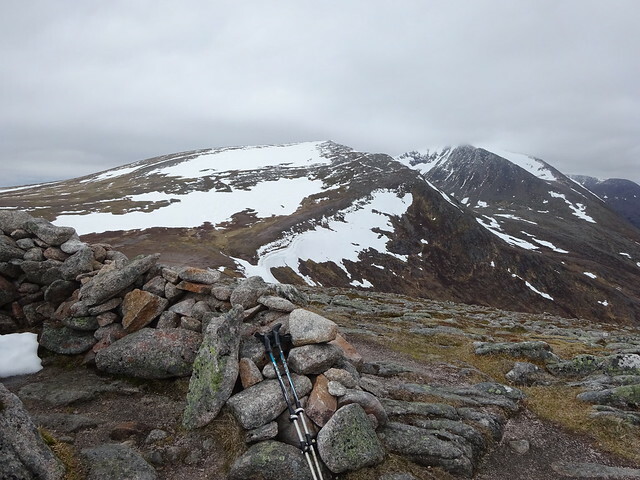 Their plan after the Devil’s Point was Cairn Toul, Sgor an Lochain Uaine and maybe Carn na Criche if the legs held out and then return to the bothy. A long enough day for all of us, so we said our goodbyes. 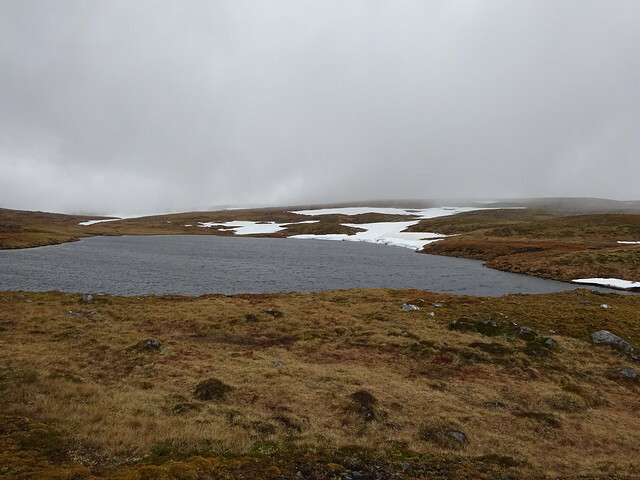 Cairn Toul had been cloud free earlier but on the ascent the mist came down and as a consequence there was not much to see from the summit. 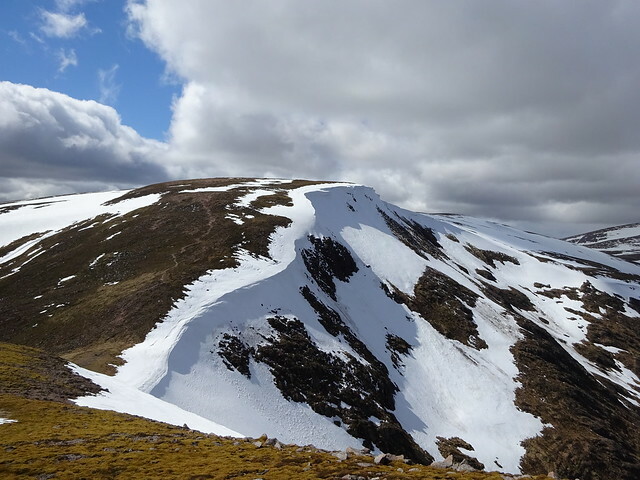 Luckily the snow on the ground was only patchy, so I could still make out the edge of the ridge which was a useful handrail to get to Sgor an Lochain Uaine. 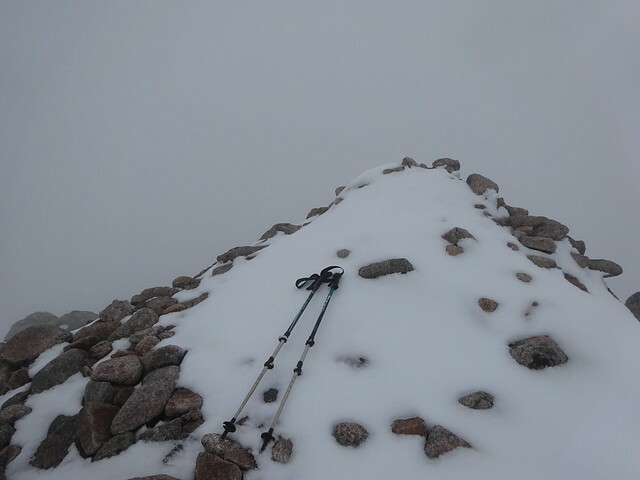 I had just finished my lunch at the summit of Sgor an Lochain Uaine when the group of three caught up. We had a chat about the conditions and one of them remarked that my navigation skills must be good. To which I replied that I was learning with every trip. Words of the prophet indeed. My original plan had been to continue to Braeriach. But progress had been slow with the poor visibility and snow. So I decided to make an early exit, before tiredness would increase the chance of mistakes being made, like happened on an epic trip last year. 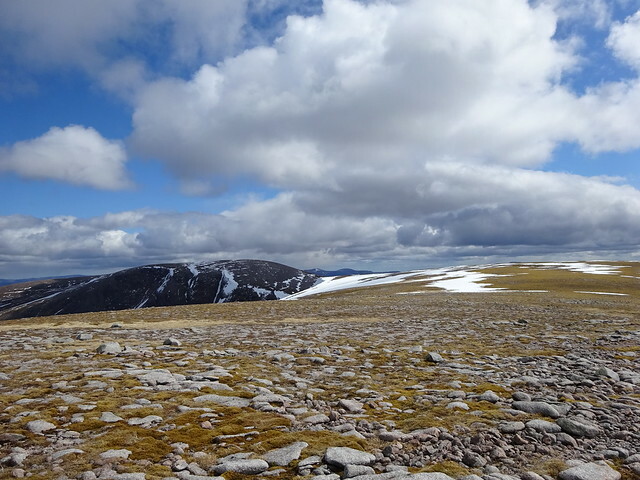 I would walk to Carn na Criche and from there go SW, along my original descent route but skipping Braeriach. The others also decided to cut their day short and made their way back to the bothy. 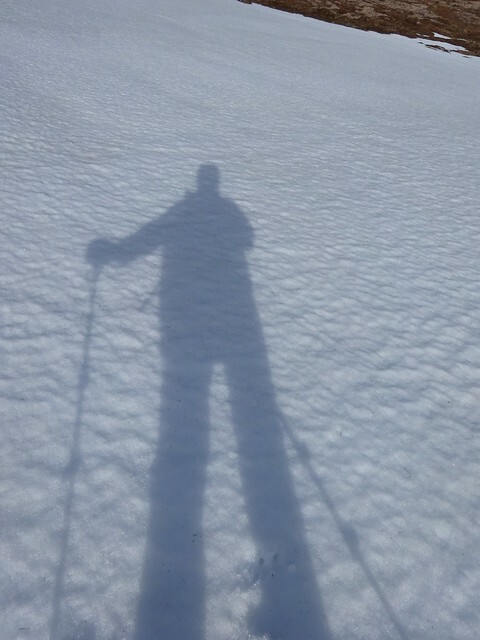 More patchy snow so route finding wasn’t too difficult. 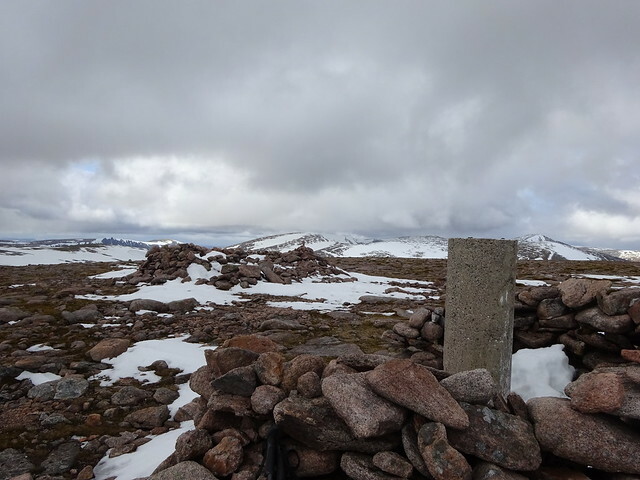 At the bealach was a bigger snow field. I walked round it just to be on the safe side as visibility was poor. Onwards to Carn na Criche. A bit further on there was a snag: no more patchy snow but an expanse of white everywhere I looked. It was impossible to tell the difference between the snow and the sky, or for that matter where the edge of the ridge was. Well, it could have been worse, at least it was not snowing. But continuing to Carn na Criche was obviously no longer a good idea. What now? A quick position check on the GPS confirmed that Carn na Criche was close enough for a SW descent from here. With a compass bearing for Loch nan Cnapan I started downhill into the white void, leaving the GPS switched on as a back-up. After a few steps it stopped working and a change of batteries made no difference. Right, back to basics then: follow the compass bearing and stick to it no matter what my own sense of direction said. Easier said than done. So what if the compass needle swings with every step? It didn’t take long to figure out that I was to the side of a ridge and the angle of the slope made me veer off downhill to the south. However, sticking to the bearing felt like over-compensating, as if going round in a big clockwise circle. 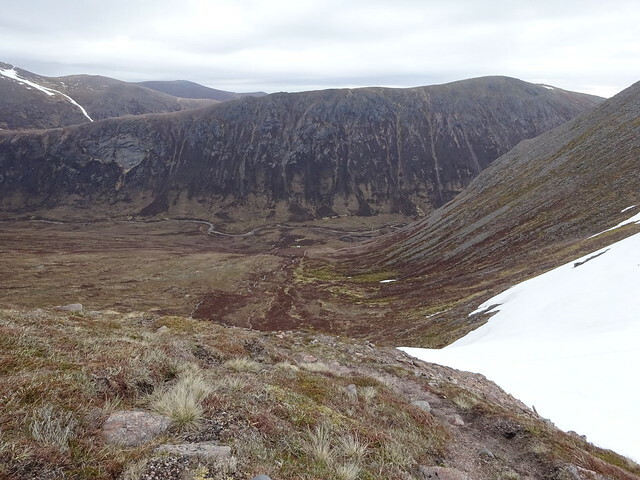 This was extremely disorientating and scary: the steep corries above Loch Einich were somewhere that way! It was hard to ignore my own sense of direction and it was even harder to not panic, but the compass was my only hope. Not sure what made me look behind me. But I did and I saw my own footprints. Thankfully the few that were visible, seemed to go in a straight line. Well done, have faith…. On it went, follow the bearing, check footprints, whilst keeping the eyes peeled for a change in the terrain, but there was nothing to see. I only felt the angle of the slope change and hoped this meant I was now on the ridge instead of to the side of it. After what seemed like ages the end of the snow was reached and a while later Loch nan Cnapan. As I walked on, the mist got thinner and I recognised Tom Dubh and the steep sided slopes that hold the Allts Luineag and Sgairnach. And there was the track. Phew! On the remains of the adrenaline quick work was made of the track and the path which passes just below Carn Ban Mor. By then I had calmed down and decided to nip up Sgor Gaoith, it would only be 4km there and back. 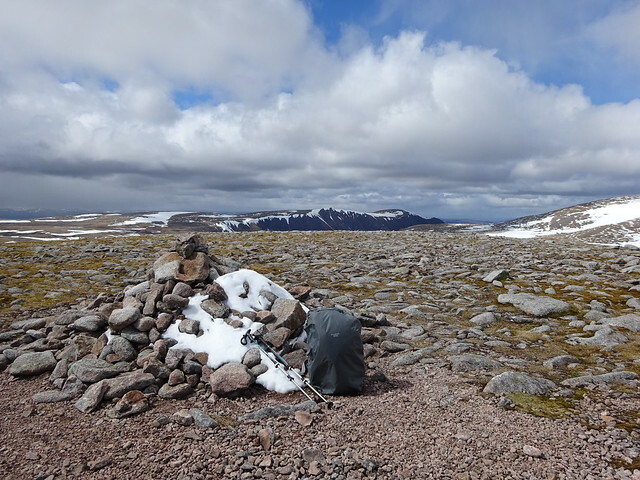 There is a cairn which helpfully indicates the start of the ´path´ (it disappears soon after) towards Sgor Gaoith. Being higher up, the cloud was back so I relied on the compass again to get me there. Sadly from the summit there was not much to see of the impressive cliffs and Loch Einich below, so I would have to return on a better day. Back at the cairn below Carn Ban Mor I had a quick refuel and then started downhill. 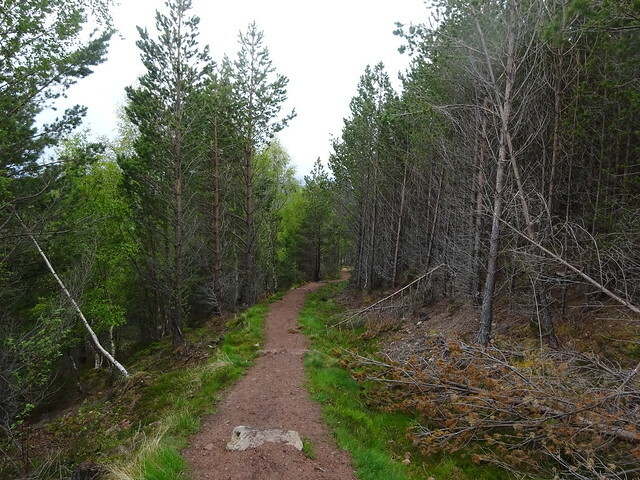 The path really is superb and lower down very pleasant as it descends through the woodland back to Auchlean. It was good to arrive back at the car! 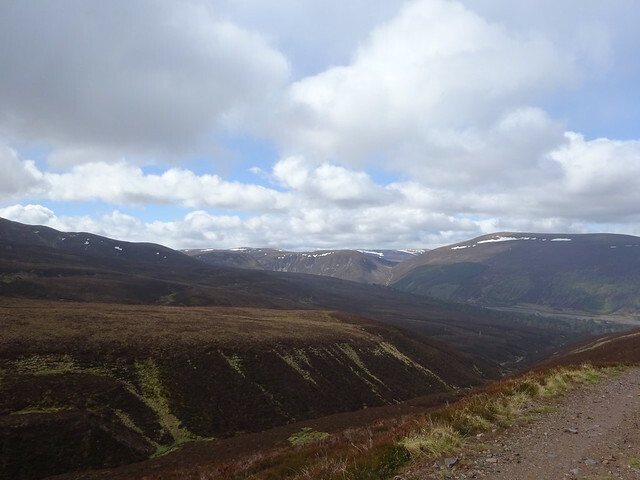 Driving back to Aviemore I remembered a conversation I’d had a few days earlier with another walker. We were talking about walking solo. I’d made the observation that walking on your own gives instant feedback about your skills and that you learn quickly. Q.e.d., as demonstrated above. The hills taught me a few things today. I was that concerned I went back to the summit and took a compass bearing which confirmed that the GPS was showing the correct way but still my sense of direction told me I was heading to certain death! I picked up a handful of stones and and as I walked I threw them a few metres in front of me into the white abyss - as long as I heard them land I knew I was safe to continue!! It's very scary going against your sense of direction in no visibility but staying calm and trusting in your experience is key - you feel all the more confident for getting through it! Thanks for the positive comment laconic surf! Your adventure on Beinn a’ Chreachain sounds scary too. Throwing the stones was very resourceful. I’ll remember that if I ever get caught in clag like that. Cheers. The disorientation, feeling like walking round in circles and everything in me resisting to follow the compass bearing was a completely new experience for me, but useful. If it happens again I will know what to expect. That brought back good memories of some great walks from the past - thanks! dogplodder wrote: That brought back good memories of some great walks from the past - thanks! Thanks dogplodder! 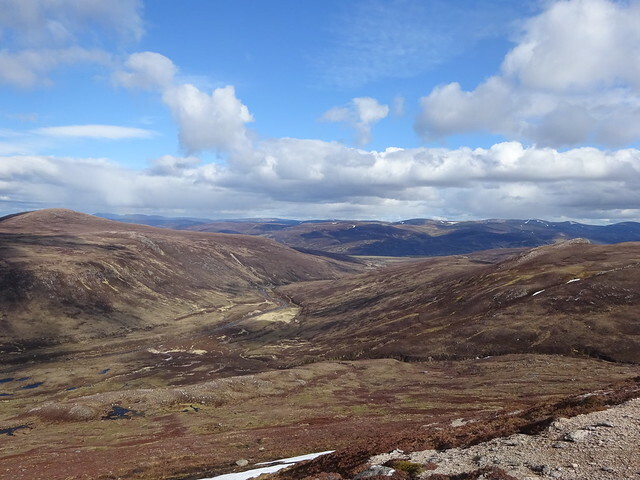 The Cairngorms are amazing. 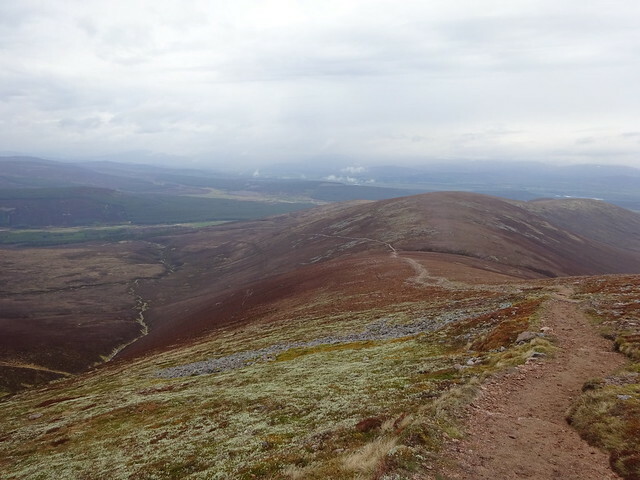 Up till this year I’d only done low level walks in this part of the Cairngorms. The glens/ lairigs are pretty awesome and there is even more awesomeness high up. A great area to which I will return! Cheers Rodmiester! Yes, it is best to trust the compass, provided you haven’t made mistake when taking the bearing. I did that last year and went down the wrong side of a hill with lots of loose rock. Should have listened to my instinct on that occasion. That’s where it gets confusing. Needless to say, this time I quadruple checked the bearing before venturing into the white abyss. ...and good adventure with a new experiences too ! Thanks Beaner001! I was swearing when I saw him slip. It was scary to watch. Actually, this route is an ‘easy’ option, I saved myself a lot of mileage on walk ins/ walk outs. And once you are high it doesn’t take that much extra effort to link munros up. But definitely a trip I enjoyed very much (apart from 1 hour on the second day ). Thanks Petr! Definitely an adventure and a useful experience. Nice one siverhill. That was a long couple of days. I've been in that area a few times this year but not on a big overnighter like that. A few years ago I dropped into Glen Geusachan from the col between Monadh mor and Beinn Bhrotain. That was in summer conditions though ie p***ing rain I remember it being fairly steep but easy enough. Do you think you would have gone down that way if you had an axe with you? The time I was there I camped overnight at the corner of the Geusachan burn and the burn was impassable at that point. I wouldn't have liked to attempt the Dee where you crossed it. Thanks Sunset tripper! I only have summer hill walking experience and wouldn’t know what to do with an axe! My tactic was to avoid situations which require skills I don’t have, though it didn’t quite work out that way for the second day. I’m thinking of doing a winter skills course, which in any case will be fun, and who knows useful for my holiday next June. Wow, that is quite a two-day marathon. I'm full of admiration - that's all I can say! Thanks Annie, you are very kind!